EIS is your one stop source for just about any type of custom belt you need. Call or email us or just fill out our order form to receive a free quote. 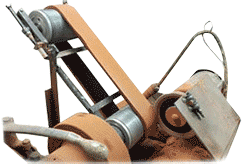 We rebuild existing belts as well as supply new belts. 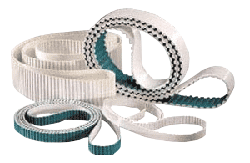 EIS offers a variety of belt covers, for timing belts, poly-V belts, & flat belts. Covers can be ground smooth or be provided with profiled contours. You can also download a PDF version (48KB) of this form to print out and fax to us. With an old belt on the machine and at the proper tension, measure the distance. This is the width of the belt. This is the actual diameter of the pulley. Do not measure flanges. Both drive and take-up pulley should be the same size. This is the actual thickness of the primary cover material and should not include the foundation thickenss. Select a style by selecting a radio button and then fill in the values in inches.